Diverse experience in campaign management, graphic design, and digital marketing. Leverages dual creative and visual strengths to present clear and stunning graphics and creative content. Strong project management skills, driving initiatives from conception to completion; manages multiple priorities effectively, delivering each on deadline and with keen focus on quality. 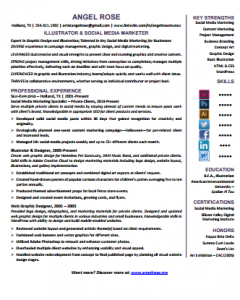 Experienced in graphic and illustration industry; learns/adapts quickly and works well with client ideas. Thrives in collaborative environments, whether serving as individual contributor or project lead. Serve multiple private clients in social media by staying abreast of current trends to ensure posts work with client’s brand. Knowledgeable in appropriate SEO for client products and services. Developed solid social media posts within 30 days that gained recognition for creativity and originality. Strategically planned one-week content marketing campaign—Halloween—for pet-related client and increased leads. Managed 10+ social media projects weekly and up to 25+ different clients each month. Create web graphic design for Homeless Pet Sanctuary, 3AM Music Band, and additional private clients. Solid skills in Adobe Creative Cloud to design marketing materials including logo design, website layout, illustrations, and gallery implementation. Established traditional art concepts and combined digital art aspects at clients’ request. Created hand-drawn posters of popular cartoon characters for children’s parties averaging five to ten parties annually. Produced themed advertisement props for local Petco store events. Designed and created event invitations, greeting cards, and flyers. Provided logo design, infographics, and marketing materials for private clients. Designed and updated web graphic design for multiple clients in various industries and small businesses. Knowledgeable skills in WordPress with ability to design and build mobile-enabled websites. Reviewed website layout and generated artistic theme(s) based on client requirements. Fashioned web banners and vector graphics for different sites. Utilized Adobe Photoshop to retouch and enhance customer photos. Overhauled multiple client websites by enhancing usability and visual appeal. Handled website redevelopment from concept to final published page by planning all visual website design stages.